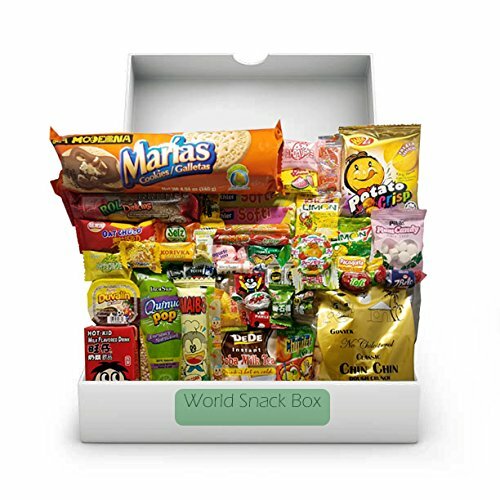 This world snack box is filled to the brim with a variety of delicious snacks and treats from around the world. This box is the perfect care package for college students, friends, family and co-workers! They may include include (but not limited to): crisps, cookies, hot peas, biscuits, beef jerky, pickles, chin chin, dagashi, chewy candy, sour candy, and more. However, we cannot make any guarantees on the contents of your box. Please snack responsibly; keep in mind our snacks trek the globe and are not guaranteed to be allergen free and could include: peanuts, almonds, cashews, walnuts, various fruits, gluten, lactose, shellfish, soy, eggs, wheat, etc. Please do not risk your health for a tasty snack! MAKES A Perfect GIFT! Tired of the same old snacks? We deliver a huge assortment of unique and tasty treats from around the world to your doorstep. THE WORLD'S BEST SNACKS - This box includes a variety of the best international snacks. There will be dozens of savory and sweet snacks anyone can enjoy. SNACKS GALORE! - You will receive 48 individually wrapped snacks that make it easy to take them with you anywhere on the go! ENORMOUS ASSORTMENT Each box is filled with a wide variety of different global treats; including but not limited to: chips, crackers, cookies, chocolate, biscuits, beef jerky, pickles, cookies, chewy candy, sour candy, and more. Snacks in each care package will vary as they are based upon availability! If you have any questions about this product by Nom Nom, contact us by completing and submitting the form below. If you are looking for a specif part number, please include it with your message.